(L) A view of Eta Carinae by NASA's Hubble Space Telescope in 2000. (R) What the star could look like in 2032, when it overshadows its nebula. Part of its nature was revealed in 1847, when, in a giant eruption, it ejected a nebula called the Homunculus ("little man"). 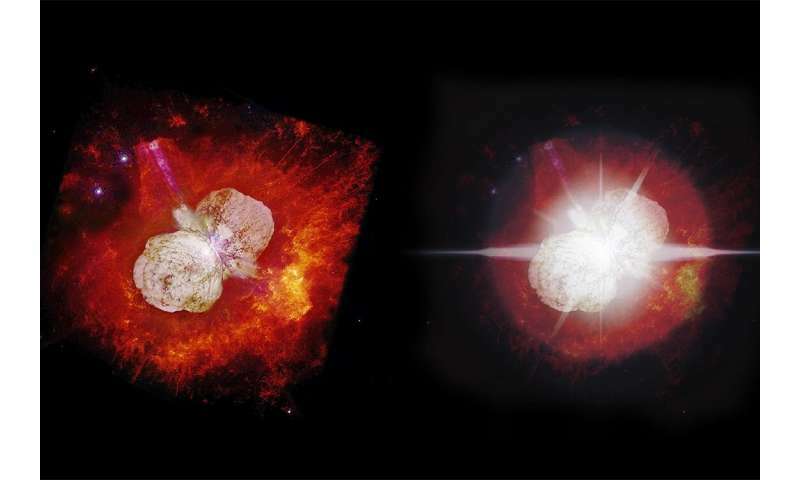 The event made Eta Carinae the second-brightest star in the sky after Sirius, visible even in broad daylight and (later) easily distinguishable from other, similarly unstable stars called Luminous Blue Variables, whose nebulae are not so clearly visible. "There have been a number of recent revelations about this unique object in the sky, but this is among the most important," said Moffat. "It may finally allow us to probe the true nature of the central engine and show that it is a close binary system of two very massive interacting stars." At my age? I could get excited over a heavy-duty thundermug of the gods. Be the most damn useful thing they ever did for me!